The Olympian this morning pointed out the difference between Olympia's youth outreach efforts and the Tumwater youth program. Olympia recently cut their $30,000 or so program because it didn't attract much of a following and Tumwater's $120,000 program is roaring along. Colton Rose, 16, a student at Black Hills High School, walks to the center in the afternoon to get away from his brothers, he said. “It’s a pretty fun place to hang out,” Rose said, adding that he goes there to play pool, listen to music and visit with friends. 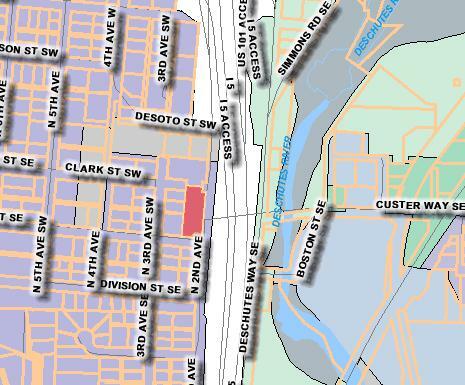 Olympia's old teen drop in program (the red box) was surrounded by (green) commercial zone and Tumwater's program (also red) is surrounded by residential purple. In a city that strives to be pedestrian friendly, we need to put appropriate services where they are needed. Teenagers who can drive to a drop in center in downtown Olympia aren't going to drive all the way downtown to play pool, they're going to their jobs or somewhere a bit more fun. 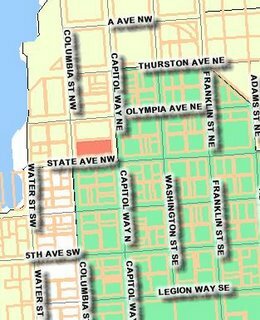 Teenagers who aren't old enough to drive or don't will walk to a drop in center near their home. To that end, a joint program between the city and the school district for a couple of drop in centers on the west and east sides would likely work a lot better than one downtown.